Google Cloud Messaging (GCM) is an infrastructure that allows you to do simple and reliable messaging to distribute your messages to and across many devices. Single devices. Each device has a unique registration token. If you want to reach that device -- for example using GCM to build a 1:1 chat application, you can do so, addressing it via that token. Device Groups allow you to bundle devices together into a group. For example, one of your users might have multiple devices -- including the very common scenario of having both a phone and a tablet. Using Device Groups in GCM, you can send a message to all of her devices, and if you desire, you can implement your app so that dismissing on one dismisses on all. Topics allow you to create interest groups for your users. Once they subscribe to a topic, you can send messages to that topic, and your users will receive them. There’s no subscription limit to these, so you don’t have to worry about how many users subscribe to your topics! Some great scenarios of topics being used to improve user experience can be found in this blog post. When it comes to reliability of messages, an internal study at Google found that the majority of notification messages (95th percentile) are delivered within 250ms to connected devices. Connectivity is impacted by many factors -- including carriers, routers and local connectivity. Indeed, in some locales it is common for people to disable mobile data for large parts of the day in order to save on bandwidth costs. In this scenario, users will still receive their notifications once they re-activate their data connection. 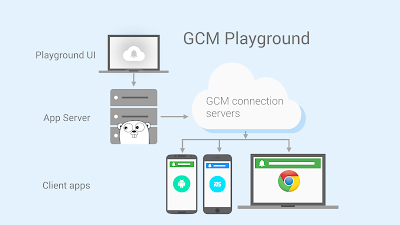 We’ve provided a number of resources to help you to build apps using GCM. Check out this talk where you are taken step by step through building an Android app and an associated server in PHP. 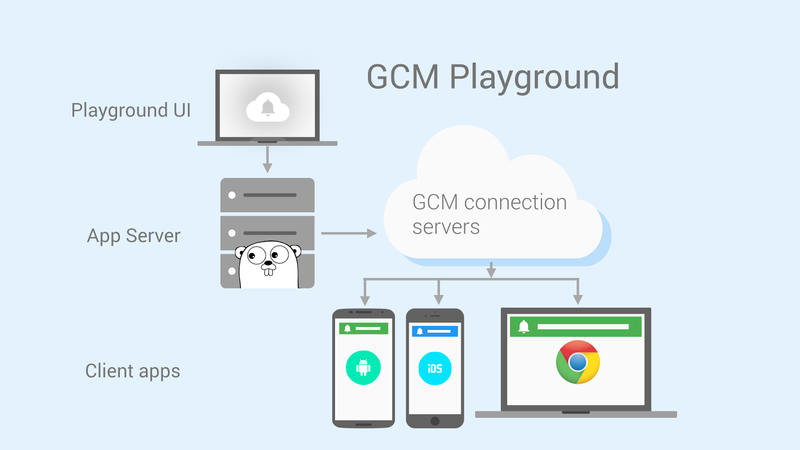 There’s also an open source ‘GCM Playground’ on GitHub here, which provides a sample server implementation that runs on the Google Cloud Platform! If you want to reach iOS users, today we’re adding an API that will help you to migrate your existing infrastructure to send notifications to iOS device, with no client code changes required. With the new batch Import API you can import the APNs device tokens that you collected from your iOS audience into GCM, and immediately start sending notifications through GCM. After you import the APNs device tokens, you can also use the InstanceID API to transparently subscribe users to GCM topics, achieving efficient fan-out of notifications based on interest groups, once again with no changes required on client code. We’re continuing to build and innovate on this platform -- stay tuned for lots of cool new features coming soon! You can learn more about Google Cloud Messaging on the Developers site here, including quickstarts for Android and iOS!